Carole wanted to use her own 3mm brilliant cut diamond which weights 0.23cts as the basis for a bespoke dress ring design. 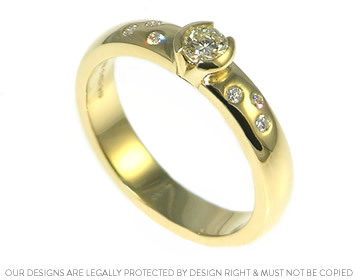 I created this beautiful 18ct yellow gold ring which holds the stone in an end only setting.In each shoulder there are three diamonds invisibly set in a scattered pattern into the band. The ring has a D-shaped profile and a polished finish.